There are many surviving Tudor documents that refer to perspectives without defining what they are. It is unclear if they are the image or the optical device that produces the image. In 1584 Reginald Scott's Discovery of Witchcraft (Published by W. Brome, London) he writes: "But the woonderous devises, and miraculous sights and conceipts made and conteined in glasse doo farre exceed all other; whereto the art perspective is verie necessarie". They were certainly optical devices of some sort that provided viewers in the Tudor period with a new perspective of a scene or object. Distorting mirrors would fit the description well, or a magnifying glass. Shakespeare makes four mentions of perspectives in his works. In Sonnet 24 it is fairly clear that the perspective he is referring to is a painting. And perspective it is the painter's art." Shakespeare is here perhaps describing the painters art in creating a three dimensional image on a two dimensional canvas. A natural perspective, that is and is not!" Orsino is talking here about his surprise at seeing the twins Viola and Sebastian together for the first time and the phrase is understood as such. "Contempt his scornful perspective did lend me..."
However, he promises to be a good husband to Helena despite the deception. Again Bertram's words are quite easy to understand and do not refer to any optical device. However, in King Richard II (Act II Scene 2) I think that Shakespeare is referring to an optical device of some sort and one which must have been familiar to his audiences. Which for things true weeps things imaginary." Some commentators think this could be a telescope but I am not convinced. Whatever the device was it would have been clearly understood by the audience that to work it needed to be looked at in a certain specific manner. Later in the same play in Act IV, Scene 1 King Richard hurls a mirror to the ground where it smashes into pieces ("O flattering glass"). Possibly King Richard's perspective is the mirror that is on stage and is later smashed. In the early 1960s the TV series The Avengers was filmed live direct to film with many locations recreated on a low budget in and around the studio at Teddington. Patrick MacNee who played Avenger John Steed used to say that "if it is on the plot (i.e. the set) it is in the plot (i.e. the story)" as there was little spare money for acting props. If we apply Patrick MacNee's logic to Richard II then just one optical prop would have been all that was required for the play to be performed. Diana Rigg who trained at the Royal Shakespeare Company later went on to become the Avenger girl Emma Peel. In 1992 I saw Diana Rigg in the play Medea in London at the Almeida. I enjoyed the performance so much that I wrote to her and unexpectedly I received a charming handwritten reply. A further clue to what was understood by a perspective is given by one of Shakespeare's collaborators. The play Pericles is thought to be a collaboration between William Shakespeare and George Wilkins. Acts 1 and II are thought to be the work of Wilkins and Acts III, IV and V the works of Shakespeare. Wilkins and Shakespeare were also called on as witnesses in the case of Bellott versus Mountjoy in 1612. Shakespeare lodged in Mountjoy's house in 1604 on the corner of Silver and Monkwell Street. Today these streets have gone but the church yard of St Olave's Church is in the near vicinity of where the Mountjoy's house stood. 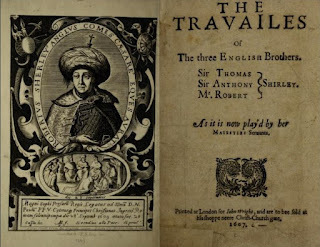 George Wilkins wrote another play in 1607 called The Travailes of the Three English Brothers together with two other authors John Day and William Rowley. In the final act of the play the three brothers are located on three different continents but are able to see each other using perspective glasses given to them by Fame - the narrator. There is no mention in the play of how the perspective glass is made and possibly the Jacobean audience might have thought that it worked by magic. However, the play audiences were quite happy to accept the notion of a perspective glass or optical device that enabled the user to see far away objects and people. Apart from the Digges-Bourne Tudor telescope the next earliest known telescope is Hans Lipershey's Dutch Trunke in 1608. This is one year after Wilkins registered his play at the stationer's office on 8th June 1607. This does seem to suggest that there was some sort of well known optical device in the late Tudor and early Jacobean period. But what that device was and if is was the Digges-Bourne Telescope we just do not know. Harriot, Digges, Dee and Chekhov! Telescopes and "The Common Herd"